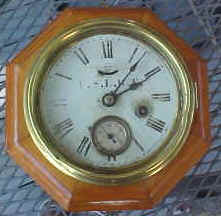 Chelsea USLHS 8 Day clock, 5" diameter. Several types of clocks were used in the lighthouse service and were made by mainly 3 different manufacturers, Seth Thomas, Chelsea Clock Company and E. Howard Company. These clocks were used to keep the time at many stations, lightships and lighthouse tenders. Time was very important to lighthouse keeper's to not only make sure the light was flashing correctly but to note times of significant events at the lighthouse. Significant events include keepers or assistant keepers leaving the station on business and noting their return, ship wrecks in the area, when storms came in or vessel sightings for instance. Time was important at the lighthouse and for that lighthouses and lightships had official issued clocks. Some were small round brass clocks mounted on a wall in the lighthouse or light vessel. Some of these clocks were used in the tower and a larger wall clock was hung in the lighthouse. These were usually made by The Chelsea Clock Company in Boston, MA. Chelsea is still in business today. Station wall clocks were usually made by either E. Howard or Seth Thomas. 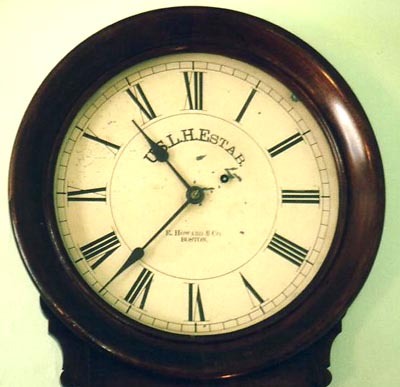 A typical E. Howard is pictured here and was a banjo style clock. These clocks like all others at the time were hand wound and were usually eight day clocks. These would be displayed in a main living area of the house or parlor. E. Howard made many of these style clocks and some say U.S. Lighthouse Establishment on the face or U.S. Lighthouse Service for newer styles. 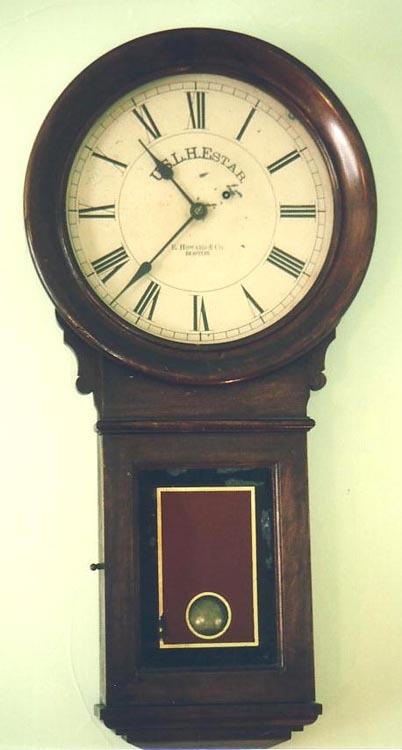 Another style that E. Howard made was a regulator type clock with a pendulum which swings back and forth. These are rarer to find than the typical E. Howard which was made by the hundreds. These clocks were made with a high degree of quality and many can be found in museums across the country. Small pocket watches were also used by lighthouse keepers. A small pocket watch could be easily carried up into the tower to make sure the light was flashing correctly. These were usually bought from a vendor and inscribed by the lighthouse service. Some other styles of clocks existed and will be documented as they are found or researched. We would be happy to receive any information on other clocks from anyone how has it. This clock is a rare find. It is an early Seth Thomas USLHE clock from between 1865 to 1875. The face Bezel measures 6-1/2 inches and overall is 8-1/2 inches. It is in a pine or spruce case. Chelsea USLHE 8 Day clock, 4" diameter. 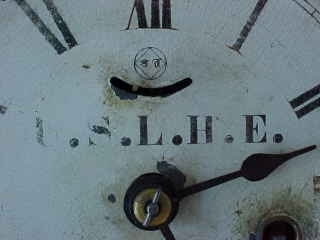 E. Howard USLHE 8 Day banjo clock, common at most light stations. Another style of USLHE 8 Day regulator style clock. Possibly made by Seth Thomas. E. Howard USLHE 8 Day regulator style clock, not very common at light stations.